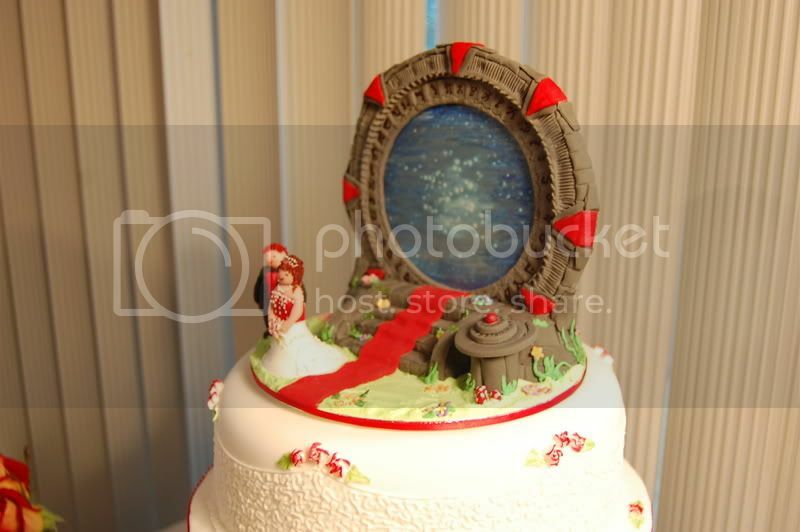 Thread: My Stargate Wedding Cake. 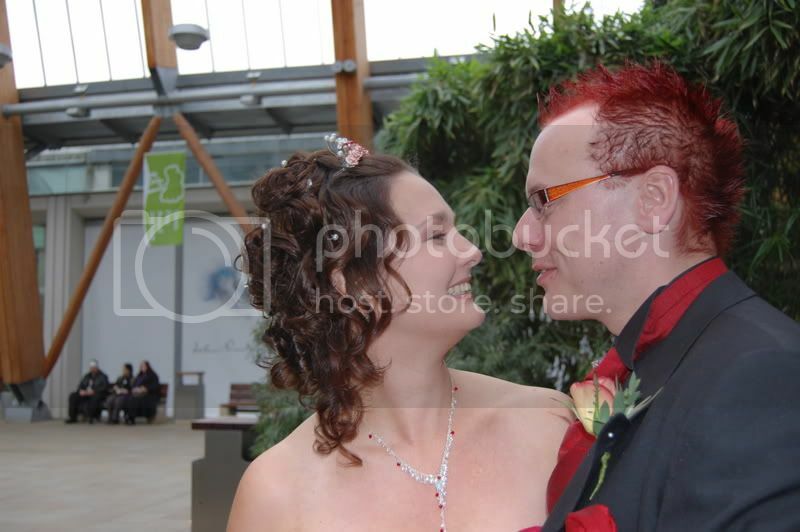 Got married on September 27th and this little gem was knocked up by my wifes parents. Absoluteley everything on the top display is hand made, including the wormhole connection which is hand painted icing. And apparently the gate is symbol correct as well. You can't see them too well but the bottom tier has earth glyphs running all around the outside of the cake, and non gate related.. the roses on the bottom tier are also hand made and edible. Just got to find something air tight to display the top section in now as it's definateley not being eaten. And incase anyone wonders why the male figurine has red hair the final pic should answer that. Hope you like the cake..... let me know your thoughts. 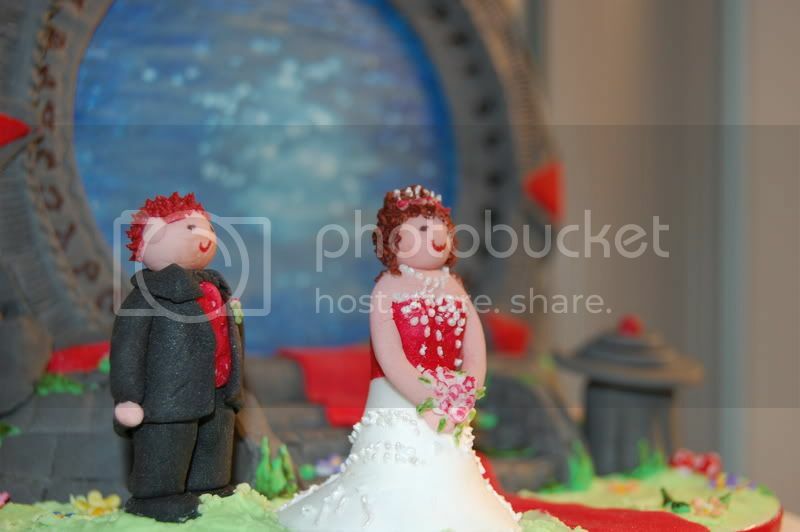 Re: My Stargate Wedding Cake. Okay...this is so cute! Lovely, really! I forgot to say CONGRATULATIONS!!!! Last edited by JackandSamAddict; October 20th, 2007 at 11:48 AM. Wow, that is really a nice wedding cake. The detail is amazing. You got some great in-laws there! I love the cake. It must have taken forever to make. Wow. That looks like it took allot of time to make. So what did your friends/relatives who don't watch/like the show think of the wedding cake having such a unique top? I have only told one friend that I watch the show because so many people assume people that watch sci-fi shows are the fanatics that goto startrek conventions in homemade costumes and look like the three computer experts from the x-files when not in costumes. There didn't seem to be much reaction to the fact that it's Stargate, everyone was just awed at the actual piece. Of course, the people who did know what it was all about were even more impressed. As for the wifey's mother who did the majority of the work, bless her, she borrowed my Stargate visual companion to get some stock to work from and having never seen it before she even parked up and watched a few episodes to get an idea as to what the fuss was about. As soon as i can get some pics i'll post up the Stargate wedding invitations and place settings, all of which were hand made by the missus. Congratulations on your marriage. That is the coolest wedding cake ever. Congrats on your marriage. That is fantastic. In-laws get a gold star for that one. Congratulations on your marriage from me too! Your MIL did a fantastic job especially for not having seen the program. The cake is fantabulous! Congratulations! What a lovely couple you are. Best wishes! 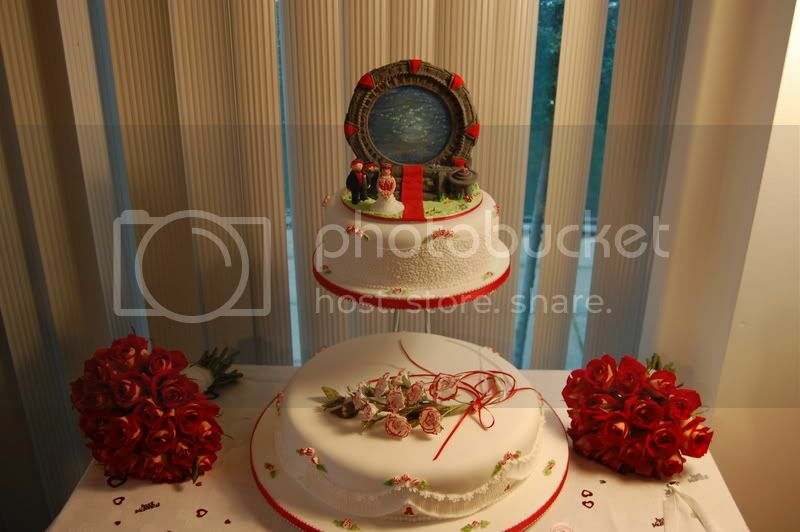 Thank you for the terrific photos of your Stargate wedding cake! Very nice. The cake is absolutley amazing. The detail of the gate and the wormhole is incredable and a really nice touch at the bottom with the earth symbol. GOODBYE GATEWORLD. BEEN FUN TAKE CARE ALL!! May we all be so well loved. I would love to see your cake pictures. But they are not showing on my computer. All that is visiably is the photobucket icons !!!!! Well, congratulations to both of your wedding. However, the wedding cake you post; here is beautiful I like it. wow that is ansolutely amazing! well done to the MIL! Awesome! 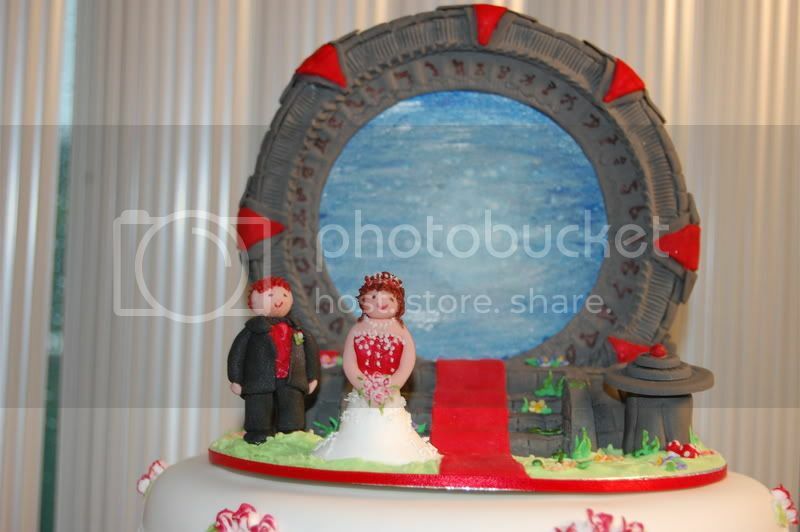 Now I refuse to get married without a stargate on my wedding cake. This may be delayed but WOW!!! That has to be the best wedding cake I have ever seen!